How Safe is Ceramic Non Stick Cookware? How is Ceramic Cookware Made? This post may contain compensated links. For more info read our disclaimer here. Ceramic nonstick pots and pans offer a greener healthier alternative in non stick cooking since they are toxin free and simple to use. Choosing the right set can be overwhelming so this ceramic cookware buyers guide aims to help. 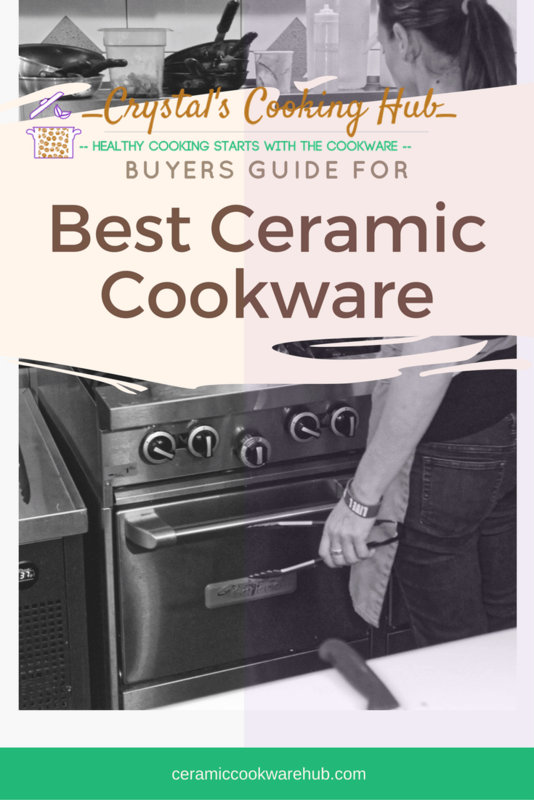 It compares some top rated ceramic cookware sets, the pros and cons, and the essentials when choosing any new or replacement cookware. In a hurry? ☞ Go to the best rated budget buy of 2019! What makes ceramic the best nonstick cookware to buy? What do I look for in buying the best cookware? FAQs. Is ceramic cookware safe? How do I care for it? Will it last? 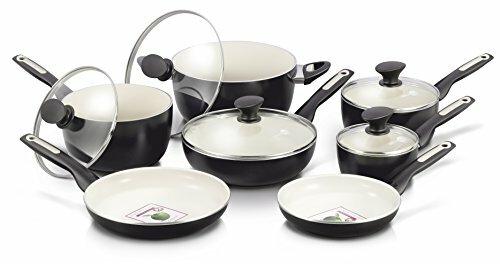 This table listing top rated ceramic pots and pans sets includes 9–10 piece family sets (with or without kitchen utensils), a larger 15-piece set, with a steamer insert, as well as 7- to 8-piece sets of cookware for the more compact kitchens. What’s so good about ceramic cookware? Ceramic is considered non-toxic and more eco-friendly than other cookware materials. In terms of the non stick cookware — ceramic pots and pans have an ultra-dense, ultra-hard ceramic (glass-like) surface, meaning, there are no microscopic pores for food particles to adhere to and this makes for a perfect nonstick cooking surface. They are also lightweight. Easy cooking. The food can be flipped and easily slid from the pan without messy cleanup needed. Less fat or oil. The non-stick surface needs little oil or fat for cooking. You can even cook meats, eggs, and fish without oil. Ease of clean up. A non stick coating such as ceramic means a quick wipe with a paper towel. Healthy. Ceramic pots and pans are free of toxins PTFE and PFOA and health is a prime consideration today, with safety a priority. Plus being nonstick, less oil and fats are required in cooking and this lowers the dietary intake of fat, suiting those watching their calorie intake or wanting to reduce cholesterol because of medical reasons. Q. So what makes ceramic non stick pots and pans different from other nonstick cookware? The main reason is they are considered healthier because the non stick coating is ceramic-based, made from silica (sand), rather than from polytetrafluoroethylene (PTFE aka Teflon), a compound known to release toxic fumes1 when heated at sufficiently high temperatures. Read teflon vs ceramic for how these types compare. Looking for More Healthy Options? HelloFresh delivers great recipes and fresh ingredients to your home each week. Cook fast healthy recipes designed by nutritionists and chefs. Restrictions apply. Click here for more information! I use these and have no qualms in recommending them. The following selection includes some of the best pots and pans in the nonstick ceramic coated range. If cookware made entirely of ceramic interests you, check out my article on a range of cookware that’s 100% ceramic. Check out this red designed Italian-inspired set. It’s a 10-piece set that includes an 8″ sauté pan, a 10¼” sauté pan; two saucepans: 2-qt and 2.5-qt with lids; a 11″ deep saute + lid; and a 5-qt dutch oven + lid. It’s heavy gauge construction means rapid and even heat distribution. The design of this cooking pan set resonates from Italy. The Bialetti cookware set here features a white ceramic interior (cadmium-, PFOA-, and PTFE-free). The handles are soft-touch and heat-resistant, made of Bakelite, and are extra long, which is great for ease of handling. The handles are riveted but the rivets are covered to help with cleaning and hygiene. The exterior of this cookware has a hi-temp silicone coating that is nonstick. This means easy cleaning to retain the attractive finish so you’ll be able to take the ware from the kitchen to the table. I also like the 5 quart dutch oven. What’s to Love or Not About This Set? This set has a deep saute pan with lid, which is great for shaking and tossing food and you’ll use less fat with this than with a standard frying technique. (Instructions say to use a small amount of oil.) The tempered glass lids allow for monitoring of the cooking process without opening the lid. The lids are interchangeable, apart from the smaller ceramic sauté pan. Watch your heating, and maintain it on low to medium heat settings on most conventional stovetops, including electric and gas. These pots and pans are not for induction cooking. The smallest pot is a 2 quart covered saucepan. In other sets listed here, you’ll find a 1-quart saucepan if you prefer a smaller pot. GreenLife began in 2013 with the idea of designing a ‘Green Life’ cookware selection to bring healthy cooking within everyone’s reach. 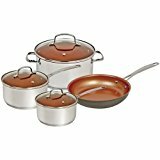 This 16-piece set includes 1-qt saucepan + lid, 2-qt saucepan + lid, 5-qt stockpot + lid, 2.5-qt sauté pan + lid, 7″ s/steel steamer, 4″ mini frypan; 7″ open frypan, 9.5″ open frypan, and four utensils. The ‘Green Life’ pans come in a choice of colors. You can choose black, red, lavendar, burgundy, and turquoise. The base is reinforced aluminum and the coating is PFAS-, PFOA-, lead-, and cadmium-free. This Greenlife cookware set has a rivet-free handle design, which allows ease of cleaning for better hygiene and durability of the coating in the area where rivets usually sit. The rivet-free design combined with features of Thermolon® on both interior and exterior surfaces should make for super easy cleaning. The cookware is designed in Belguim and manufactured at the company’s own facilities in Jiangmen, China. The current owner, the Cookware Company, also markets the label ‘GreenPan” – our ceramic pan reviews include the GreenPan set below. What to Love or Not About This Set? This set also has a saute pan with lid, which is great for tossing food when cooking. I like that the set has a fair sized stockpot, which is always great for those hearty winter soups. The 16-pcs set includes a stainless steel steamer. The glass lids allow for viewing of the food while cooking without having to lift the lid. These are interchangeable with the pot lids able to fit the frypans. The GreenLife Soft Grip ceramic cooking pans feature ergonomic phenolic handles that have a soft touch and won’t be as hot to touch as metal handles. You can choose smaller sets or larger ones to suit your cooking style and family needs. Also available in smaller and larger sets. The main obvious differences between this and the GreenLife set are the handle style and trims. This is a 12-piece set. 1-qt saucepan + lid, 2-qt saucepan + lid, 3-qt saucepan + lid, 9.5″ sauté pan + lid, 5-qt casserole + lid, 8″ frypan, 9.5″ frypan. GreenPan were the pioneers of the ceramic nonstick cookware, starting in 2007, and the first to introduce non-PTFE nonstick cookware. Their cookware sets are designed in Belguim and manufactured in China. The GreenPan Rio ceramic cooking set also has the Thermolon ceramic coating, which makes for easy cleaning inside and out. According to the manufacturer, the coating is safe from toxic chemicals, like lead, cadmium, and fluoropolymers (PFAS, PTFE, and PFOA). The handles are rivet free, which is great for hygiene and makes for ‘no fuss’ cleaning. The cookware set also comes in colors of back, burgundy, and turquoise. This also has a saute pan with lid and a fair sized stock pot (casserole). This GreenPan Rio set does not come with utensils but has a casserole pan. The glass lids allow you to see the food cooking without having to remove the covers. Heavy-gauge aluminum bases mean fast and efficient heating. The cookware is safe for oven use only at low heat, i.e., 350ºF (176ºC) oven use and for medium heat on the stovetop. The handles are phenolic and ergonomically designed. They will be cooler to touch than metal handles. Suitable for all cooktops apart from the induction type. Remember to recycle your old cookware. You can find out how here. This is a great assortment of cookware from the company that invented non stick pots and pans in the 1950s. The T fal cookware set is ideal for preparing family meals or dinners for guests. This 16-piece set includes 1-qt sauce pan + lid, 2-qt sauce pan + lid, 5-qt dutch oven + lid, 7.5″ fry pan, 11″ fry pan + lid, 10″ square griddle, and six utensils. The T-fal cookware is PFAS-, PFOA-, lead-, and cadmium-free making it a healthy choice for nonstick cookware and an eco-friendly option. The surfaces are stain and scratch resistant with an enamel finish on the exterior and a ceramic surface interior. The color choices include black and red. What I like the most about this T-fal set is that has a griddle pan, which is perfect for making pancakes, French toast, bacon, eggs, and crepes. The glass lids have vents allowing monitoring of cooking without moving the lids. Handles are phenolic and lids and handles are oven-safe up to 350ºF, while the cooking surface can be heated to 570° F. Suitable for all cooktops apart from induction type. A heavy-gauge aluminum base means fast and even distribution of heat. Care in cleaning around the rivets on the interior of the pot or pan will avoid wear to the ceramic surface. T-fal also makes ceramic coated stainless steel cookware sets. These are suitable for all cooktops including induction types. Only the frying pans are ceramic nonstick, the rest is stainless steel. Perfect if you like more durable pots for stews etc. but want the fat-free benefits and a healthy option in a non stick pan. This ceramic cookware pot set is designed in the USA. The set comes in popular colors of Aqua, Blue, Gray, and Lavender. The double heavy-gauge aluminum base aids the cookware’s performance of even cooking without hot spots. I like the stainless steel accents on the handles that add extra style. These are long handles that attach to the vessel with rivets. The nonstick white ceramic surface is free from PFAS, PFOA, or cadmium. I also like the enamel porcelain exterior that is stain resistant and easy to clean. 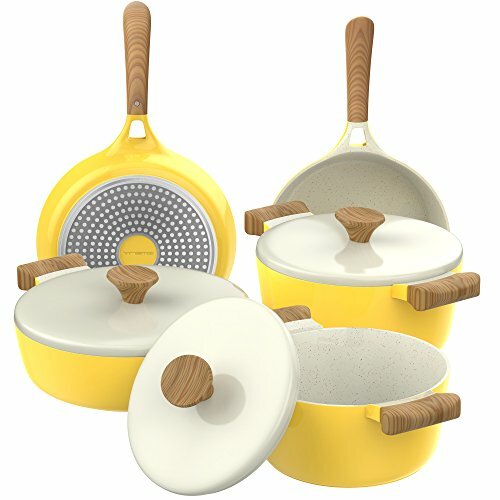 What I like the most about this set is that the 10-inch and the 15-inch ceramic non stick skillet each have a unique interior surface that is textured to enhance food release and ease of cooking. The set contains shatter-resistant glass lids, which enable easy viewing of food while cooking. The lids that fit the pots also fit the frying pans. The handles are phenolic and should be cool to touch. The cookware is oven safe up to 350ºF. This lightweight ceramic cookware set is ideal for all cooktops except induction. This is a 15-piece cookware set that includes three saucepans: 1-quart, 2-quart, and 3-quart with lids; a 5-quart dutch oven with lid; a 3.5-quart deep saute pan with lid; two fry pans: 8-inch and 10-inch; a 12-inch fry pan with lid; and a steamer insert. This ceramic nonstick cookware set is made of heavy gauge aluminum. The manufacturer claims the Pure Living design has a superior ceramic cooking surface in that it is stain and scratch and is most durable of its designs. The handles are designed for comfort with soft-touch silicone covering. They are free of PTFE, PFOA, cadmium, and lead. The pots and lids are safe for placing in ovens up to 350ºF (a moderately slow oven). This set can be used on all cooktops apart from induction. Make sure to treat before the first use to ensure the best performance (see instructions included for the set). I love the look of this mellow yellow set. This is an 8-piece set. 3-qt dutch oven + lid, 5-qt dutch oven + lid, 4-qt casserole pot + lid, 9.4″ fry pan, and 10.1″ fry pan. This set has a modern look. The pots and pans have a die-cast aluminum base that heats quickly and evenly. The lids are not clear — they are aluminum but with steam release holes (a small gap between the body of the pot and the lid). The exterior is heat-resistant enamel and claimed to be 100% Scrape Free. The handles and knobs are a wood-look Bakelite type. The interior is a marble ceramic coating that resists staining and is easy to clean. The manufacturer claims the coating is lead-free, BPA free, PFOA free. The pots are versatile in that they are designed for cooking and then serving, with handles both sides for easy maneuvering and an exterior in a color to add vibrancy to your table. The set is available in green, blue, or yellow from Amazon. Also, no seasoning of cookware is required. You can’t go wrong with two fry pans, two dutch ovens, and a casserole pot for preparing meals on the stove top. But, as far as for oven use, I wouldn’t depend on these for that style of cooking since the handles and knobs are made of Bakelite. This set suits all stovetops including induction, gas, electric, and halogen types. When using on induction always make sure the size of the cookware base is larger than the element size. Handles may become hot during use if left sitting over heat. The company, NuWave LLC, was founded under J. S. Moon in 1993 and produces some of the best induction cookware. 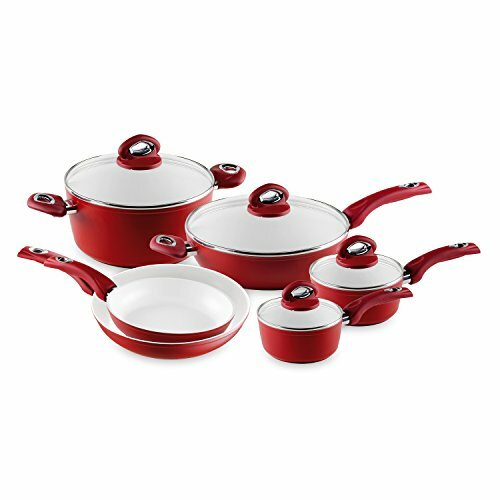 This 7-piece set includes 1.5-qt saucepan + lid, 2-qt saucepan + lid, 5.5-qt stock pot + lid, 10.5″/12″ fry pan. The pans are hard anodized aluminum based with a steel core for conduction. The interior has the Duralon® ceramic nonstick coating. The exterior is hard anodized to give it durability and resistance to chipping. The set comes in one color, bronze. It features a bronze-colored nonstick ceramic surface that is free from PFAS and PFOA. I like that the pieces are super easy to clean; the handles are cool-to-touch stainless steel, and the set can be used in the oven. The set contains tempered glass lids with vents, which let you view the food while your cooking and also allow for built-up pressure release. There is no need for seasoning of cooking surface. The cookware is oven safe. This set is one of the best rated cookware sets for induction cooking. But, it also suits electric, gas, ceramic, and glass stovetops. You can choose a 10″ or a 12″ ceramic frypan. What Do I look For in the Best Cookware? Cookware is an everyday item and an important purchase because it is something you will want to last for a fair amount of time. All the best cookware reviews will tell you that performance and design are what matters the most regarding your satisfaction with your purchase. And, let’s be real, the price you are willing to pay plays an important part in your decision. But… you should also consider your cooking style and the type of cooktop you use. And, are you one for convenience, less mess, and/or want to reduce your intake of dietary fat from cooking. In this case, you’ll be looking at a healthy nonstick choice like nonstick ceramic or perhaps cast iron cookware – see my guide on the best-cast iron pan. Do you want fast and even heating? Most nonstick ceramic sets have metal bases that will conduct heat well, saving on energy costs and providing quick and easy cooking. The best ceramic pan for this sort of performance is a non stick one with a metal core that conducts heat and distributes it fast and even. By the way, the 100 percent ceramic cookware types are ideal for slow cooking on the range top or oven cooking as they absorb and withstand high heat. (Superb for locked-in flavor and goodness of hearty pot meals). Those with a thin base will burn your food too easily. A heavy or thick metal base will be less likely to warp and a flat base is critical, or one that is slightly concave (like the bottom of a wine bottle) as it will flatten on heating. How important is ease of cleaning for you? If you’re wanting easy cleanup and fat-free cooking, you’ll want nonstick cookware. A ceramic coating means easy cleanup of cookware. Just a simple wipe with a paper towel can be enough. What about being safe for your health? Check that the cooking surface of the cookware is free of PTFE and PFOA and of heavy metals, when searching for the best nonstick cookware to buy healthwise. Ceramic cookware is typically free of PTFE and PFOA as well as heavy metals – find out why in my FAQ section at the end. Just so you know upfront, coatings of ceramic cookware sold in the USA must abide by 21CFR170(b). The ruling goes beyond ceramic cookware made in USA to cover that sold here but made elsewhere as well. Although most of the best nonstick cookware are designed in the USA, most (if not all) are manufactured overseas. The exterior finish is an important design feature. 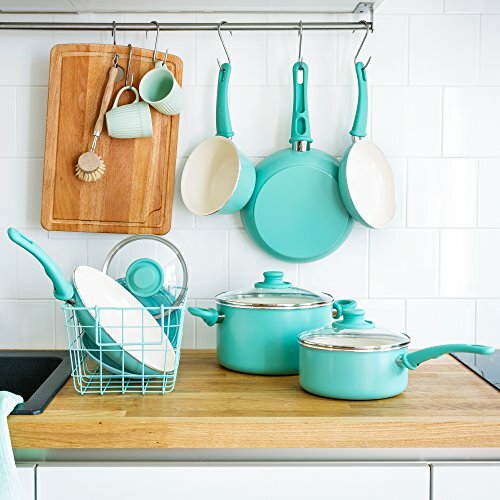 You might prefer a certain color, one that suits your kitchen. But look beyond that to the types of finishes. Ceramic glazes provide a tough exterior. These are found in 100% ceramic cookware. They contain various inorganic minerals and oxides that give strength, color, and glossiness to the cookware finish. Painted exteriors, though economical, can scratch or wear away with use. Anodized finishes are tough and chemically inert. You can read more here: Chemical Materials, Elsevier. The non-stick coating is expected to last longer when applied to an anodized pan compared to one that’s not. Porcelain enamel is a glass-based coating that is sprayed and fused to the cookware substrate through high heat (1500°F). It won’t peel, flake, or rust. Look for handles that you can grip securely as this will reduce the risk of injury when handling the cookware, moving it from the over or using it over the heat. Consider how well handles are attached, the handle length, whether they will become hot or not, and the ease of use with two hands, especially with a larger pan. Handles fixed by welding or fastening with screws can work loose over time, while riveted handles may mean areas of grime build-up and require care in cleaning for hygiene if they are not coated well with the ceramic surface. Whether the handles will be hot to touch when on the stovetop is another thing to consider. The handle should remain cool to touch when using it on the stove top or you will need to use pot holders. For stovetops (and ovens), the best handle to avoid burns is a silicone-coated, Bakelite, wood, or a hollow metal handle. Do you want clear view lids to see the food? Most people like glass lids because they make it easy to see the contents of the pot without having to lift the lid and releasing steam. Lids with vents also prevent pressure build-up in the saucepan. Some sets have lids of a size that works on other pots or pans in the set. What is your cooking style? How do you mostly cook? The quality and type of cookware to choose will depend on your methods in the kitchen. If you are preparing low-fat meals, you will want a non-stick for that best frying pan. And, you might want a good ceramic pan in that case. Here is a list of cookware and their uses. Saucepans – Best for boiling vegetables and cooking rice, pasta, and sauces. Frypans and Skillets – Best for fast frying or deglazing, searing, and browning. Griddle Pan – Perfect for pancakes, French toast, bacon, eggs, or crepes. Sauté pan – Shallow pan used for sautéing and browning. It’s best for shaking and tossing food, and techniques that use less fat than frying. Stockpot – Perfect for stock making or boiling loads of vegetables or seafood and for making soups. Dutch Oven (or Casserole Dish) – A thick-walled cooking pan that is best for the oven or slow-cooking of casseroles, stews, and roasts. Design of Rims – In pots and pans, slightly rolled rims are designed for pouring whereas straight rims are suited to the tossing of ingredients while cooking. Design of Sides – Cookware with high vertical sides are best for simmering liquids whereas those with flared sides are best for evaporating liquids while cooking. What’s Best for Oven Cooking? For oven cooking, look for oven-safe materials in the parts, particularly the handles and knobs. Mostly, the type of handle (and then the lid) will determine whether a pot can be used in the oven for roasting or baking, i.e., in the oven at high heat temperatures. The 100% ceramic cookware will withstand the highest heat of any kitchen oven. Ceramic non-stick cookware is suitable for gas, ceramic, and electric cooktops. A heavy flat base allows even distribution of heat on these types of stovetops. What Type of Cooktop Do You Have? For gas, ceramic, or electric cooktops, all ceramic cookware as long as it has a flat base will suit. Tip: Avoid using high flame settings on gas burners as this can discolor the exterior of cookware. For induction ranges, you will need magnetic base materials, i.e., cookware with a ferrous base. How much are you prepared to pay for high-quality pots and pans? Cookware sets range from $30 to $300 (up to $1000 for deluxe brands). A basic starting set would be at least one pan and three pots with lids. But, do you cook for a family? Do you entertain? Think about the size and quantity of the cookware you will need in that case. In both cases, you may need a good-sized set. For an everyday family, 8–10 pieces should give you all you need. But, for a large family of say 10–12 or if you entertain large parties, you may want to choose the larger sized options available. While it’s best to purchase good quality pots and pans, you might need to base your purchase on what you can afford at the time. Buying an entire cookware set first-up rather than buying individual pieces later has advantages in saving you money in the long run. But then, if the budget is tight, you can always add others as you can afford it, as long as you don’t mind whether the pieces match or not. Acquiring a quality cooking set that covers all your needs is worth the investment. Though it can cost a tad more initially, you should see the benefits of savings over time from not having to buy extras or replacements that are likely to be more expensive the next time around. How many pieces and what size pots and pans do you need? Will you be mostly cooking for the family or to entertain guests or both? Do you want a matching set or don’t mind mixing colors? Some best ceramic cookware brands include kitchen utensils to use with the non stick coating. Some come in a choice of colors and certain brands offer the same design in smaller or larger sets. So you can choose the size of your cookware collection. The Farberware® PURECOOK, for example, is available in aqua, but you can also choose blue (see the gorgeous blue here) or gray (check out the cool gray here) that come with the proper kitchen utensils. If you prefer cooking with stainless steel but want a pan that is a healthy non stick choice, then consider this 10-piece set of cookware with two cooking utensils included. If you are looking at ceramics because of the health benefits, don’t forget, there are two main types of ceramic cookware sets to consider. One is the ceramic coated cookware with nonstick cooking as covered in this guide. The second is the 100% pure ceramic cookware type, for example, the Xtrema ceramic cookware, which is a wholesome and natural way to cook. Why is ceramic the best nonstick cookware? It is free of hazardous polytetrafluoroethylene (PTFE) and perfluorooctanoic acid (PFOA) – qualities that make these preferable to other non-stick cookware. What’s so great about ceramic cookware that people choose it over other cookware? 1. It’s super easy to clean. Being easy to clean the ceramic pots and pans save you time cleaning up in the kitchen, allowing you the freedom to enjoy other activities. Who doesn’t want that? 2. Ceramic cookware is considered a healthy choice because it is made without the harmful PFTEs and PFOAs. This is the advantage of ceramic cookware over the earlier traditional non stick cooking pans, since PTFE and PFOA have been implicated in human and environmental health risks. 3. Cooking with ceramic nonstick cookware means less fat and oil. The nonstick ceramic surface provides a greener alternative to lowering the intake of dietary fat through cooking = fewer calories and thus lowers cholesterol intake. This benefits weight control and contributes to a healthy lifestyle. 4. Ceramic doesn’t react with acids and so won’t taint your food. What are the ceramics in the non stick cookware? The ceramic in the non stick cookware type is a non-metallic material. In respect to this, the ceramic is made from sand (silica) that is formulated in a gel solution to provide a non-stick surface (see below). Is ceramic non stick cookware safe? How is the non stick coating of ceramic pans formulated? Ceramic coatings include patented types, like Thermolon, used by GreenPan and GreenLife in their best ceramic nonstick cookware. Thermolon coatings involve a Sol-Gel procedure: “Thermolon is developed from an inorganic, ceramic polymer based on silica that is coated using a sol-gel process. It is a mineral-based coating made primarily out of a combination of silicon and oxygen – the same basic elements found in sand. Thermolon’s inorganic origins allow it to overcome environmental and engineering inefficiencies found in organic non-stick coatings such as PTFE.” (Porcelain Industries 2018) I cover how the ceramic non stick coating is made in more detail here. People might ask, what are your tips on ceramic pan care? Well, here they are — my quick-start tips for using ceramic cooking pots and pans. On receiving your ceramic pots and pans set, remove all labels and packaging materials. Before use, wash cookware with warm, soapy water. Then rinse and dry using a soft cloth or paper towel. Store by placing paper napkins or pan protectors between cookware to protect surfaces. 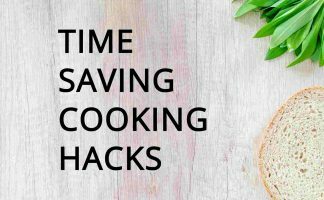 Make sure you have silicone, nylon, plastic or wooden utensils to use with your ceramic nonstick cookware rather than those metal ones that will fast deteriorate your nonstick cookware. Handwashing is best. ‘Dishwasher safe’ cookware is a feature of ceramic cookware sets. However, dishwashing is not necessary. The pots and pans are super easy to clean by hand. Take it from me it’s best to avoid the harsh detergents and any damage from the dishwasher arms to keep your cookware looking the best cooking set. Make sure the ceramic frying pan fits in the sink. Do not soak. Clean once it has cooled down. Don’t use harsh scrubbing pads. To lengthen the life of ceramic cookware, follow these tips. Ensure it has cooled before washing as adding cold water to a hot pan can damage the non-stick coating. A rapid change of temperature can also cause warping. Care for lids: Tempered glass lids are oven safe to 350 ºF Cleaning Ceramic CookwareCeramic cookware is considered dishwasher-safe for quick and easy cleaning, but I recommend hand washing for long-term ceramic pan care. Most important! Use utensils that won’t harm the surface. You can buy BPA-free utensils that won’t harm the surface, like these here. Use on low or medium heat or to temperatures advised by the manufacturer. Low to medium heat works well with ceramic cookware having an aluminum base layer, which quickly conducts heat. Do not let the cookware burn dry. As well, it is advisable to allow ceramic cookware to cool before washing. Avoid plunging your hot ceramic pan into cold water, and this could compromise the non-stick qualities of your cookware. Being ceramic, care is needed to avoid it chipping. In removing lids while cooking, make sure to tilt the lid so that it directs the steam away from you and keep hands and face away from steam vents. Glass lids with cracks, chips, or scratches should not be used to avoid injuries to users or people nearby. Hot glass lids should not be placed under cold water, as they could break or crack due to the temperature change. Tempered glass lids are oven safe to 350°F (175°C). To avoid a vacuum seal forming after turning the heat down, leave the lid ajar or the steam-vent open on the pan. Keep potholders available for use. Keep handles positioned so that they are not over other hot burners. Retighten handles and knobs that are fastened with screws that may loosen over time. Can ceramic cookware be used in the oven? Yes, but at what level the heating will depend on the handle types and the lids. It is best to check with the manufacturer as there are wide variations in designs. As a guide, ceramic cookware with a stainless steel handle is oven safe to 500°F (260°C); phenolic resin (plastic/bakelite) parts to 350°F (175°C); and silicone parts to 400°F (204°C). In most cases, you won’t be putting your best ceramic non stick pan in an oven set at a very high temperature. The best ceramic cookware for use in the oven is the 100% natural ceramic type — see my review here — which can withstand the high temperatures. Is seasoning of the cookware required? Unlike cast iron, ceramic cookware does not usually require seasoning prior to use. However, some manufacturers recommend you season their pots and pans before use with a light rubbing of cooking oil after washing in soapy water and rinsing. Always follow the manufacturer’s instructions provided with the product for warranty reasons. The below is why ceramic nonstick is better in comparison. Aluminum leaches from aluminum cooking vessels and is a considered a neurotoxin, which is a toxin that affects the brain and nervous system. Aluminum cookware is especially reactive to acidic food with older saucepans leaching more so than newer ones. This is something to consider when cooking popular tomato soups, for example. Cast iron cookware can be a great option for low-fat cooking – see my article on the best cast iron pan here! However, this cookware does leach iron into foods, especially if it is not seasoned correctly. Iron has benefits for our health, but people who suffer problems with iron build up (e.g. because of hemochromatosis) need to be watchful of this. A metal alloy product, stainless steel cookware can leach metals such as iron, chromium, molybdenum, nickel, titanium, copper, and vanadium into food. Nickel is not needed for our health. Make sure the cookware you choose comes with a warranty in case of unfortunate factory defects that may not be evident at the outset. Choosing brands and models that guarantee a lifetime warranty will serve you well for peace of mind. Make sure to follow manufacturer instruction to ensure your warranty remains valid. Economically priced items are a wise buy when you need to buy or replace a product to see you through a temporary situation and/or to suit a small budget. These buys may or may not have lifetime limited warranties — Always best to have a handle on this so you know what to expect. What is highly popular right now is the Rachael Ray Cucina Hard Porcelain Enamel Nonstick Cookware Set. See Real Owner Reviews of the Rachael Ray set here. Just know that while it has a porcelain enamel exterior finish, a check of its specifications shows that it uses PTFE (aka Teflon), not ceramic, in the nonstick cooking surface. To complement your ceramic cookware, consider buying a set of ceramic knives. These are the sharpest knives to have, will stay sharper for longer, and are easily sharpen. I hope you found value in my non stick cookware reviews. 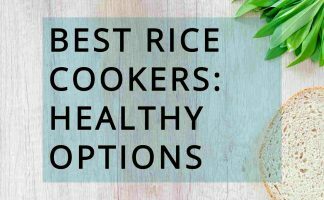 Consider nonstick ceramic pots and pans as top rated cookware sets for healthier meals if you’re looking to limit your use of fat and oils in cooking. 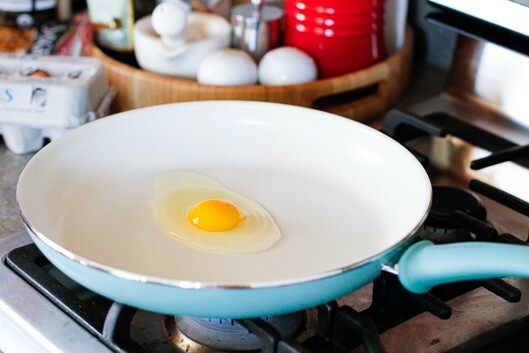 There’s one reason people buy non stick cookware brands involving ceramic surfaces: They have a safe, natural, non-stick coating (no nasty PFAS, PFOA, or PTFE chemicals). They rate high as the top cookware sets in the minds of people seeking safer healthier options. Looking for the best ceramic frying pan? See my comparison of top rated ceramic skillets here. 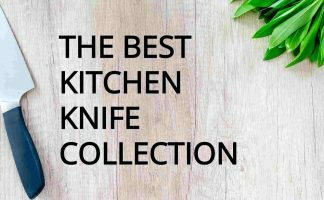 Best Ceramic Knives GreenLife Soft Grip Is Ceramic Safe? WELCOME TO THE CERAMIC COOKWARE HUB! We research the best ceramic cookware and kitchen tools on the market. 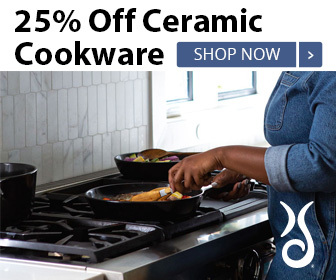 Hi, I’m Crystal and at Ceramic Cookware Hub I write about the most asked-for info on the available ceramic kitchenware to help you with that purchase. I research and compile charts, guides, and FAQS to help answer all your questions and hopefully guide you to that cookware set or kitchen tool that’s just right for you. Read more about CCH here. Is Ceramic Non Stick Cookware Safe for Your Family’s Health? How To Care for Ceramic Non Stick? Crystal's Cookware Hub Copyright © 2019.